When your project calls for security our Deluxe Internal Halyard Flagpole will meet any commercial, municipal, governmental or industrial application. These poles have a winch mounted inside the flagpole shaft operable only with a removable crank handle. The pole is more streamlined in appearance because the halyard is concealed inside of the pole. 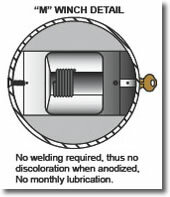 The lockable door provides security around the clock. 15' to 80' poles available. The Cam Cleat Internal Halyard flagpole combines the security of a concealed halyard system with the simplicity of a rope halyard. 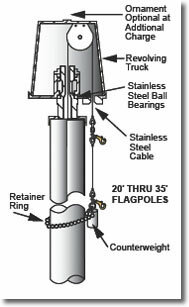 Internal halyard flagpoles are also the most aesthetically pleasing because the halyard is concealed inside the pole. The lockable door provides the owner with a sense of security around the clock.